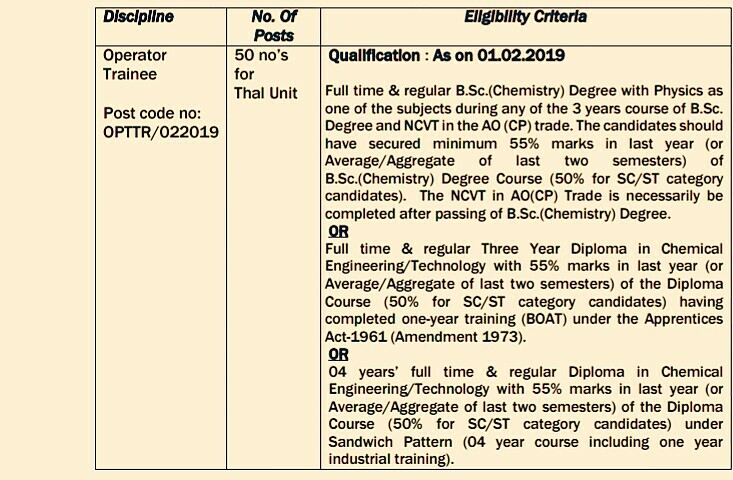 Rashtriya Chemicals and Fertilizers Ltd (RCF Ltd), Is Appointing Eligible Candidates To The Post Of Operators Trainee, So Interested Can Apply For This Through Online Application Mode, From 25th Of March, 2019, Onwards. Operator Trainee →50 Vacancies, Kindly Do Follow The Image Below For Post Code, Educational Qualifications And More. B. Eligible Criteria For Operator Trainee Jobs In RCF Recruitment Notification 2019. Age Limit →27 Years Is The Maximum Age Limit For Unreserved Candidates, As On 1st Of Feburary, 2019 . Mode Of Examination/Selection Process →The selection will be through the below mentioned steps: 1. Written / Online Test 2. Trade Test 3. Pre-Employment Medical Test. Online Application/Examination Fee →There is no application processing fee for SC / ST /PWBD candidates. General & OBC candidates are required to pay a non-refundable application processing fee of Rs. 500/-. Last Date For Online Application Form Submission →10th Of April, 2019. Fot More Info →The Official Website. Now Apply For Recruitment Of Operator Trainee RCF 2019.